Antioch - After the Battle of Ipsus in 301 B.C., effectively ending the Diadochi Wars (see Diadochi), the successor kingdoms had more or less been established. Seleucus I Nicator ("The Conqueror") rose from the brink of annihilation to control the largest of these kingdoms. Apparently he was not satisfied though. He needed a capital from which to rule. After all, Ptolemaic Egypt had Alexandria, why shouldn't he have a city to rival it? Well what he came up with was pretty close. It would be called Antioch after either his father or his son, both of whom were named Antiochus (It was not the original capital, but because of its rapid growth, it was inevitable). Seleucus actually founded four cities in the area, known as the Syrian Tetrapolis, but Antioch is the one that flourished and surpassed the other three. Most likely because of its ideal location. Situated on the east bank of the Orantes River and at the foot of Mt. Silpius, it became a popular stop along the Silk Road a couple centuries after its founding (see Silk Road). There are several legends associated with its beginnings. Alexander the Great reportedly recognized its potential as a city and planned to build one there himself. But because the conquest of Persia was his immediate concern, he decided to move on. Seleucus supposedly chose the spot after performing the ritual of feeding a portion of sacrificial meat to an eagle, which took it and flew to the spot where the city would be built. He also modeled it after Alexandria, a city where he spent considerable time while in exile and apparently admired. 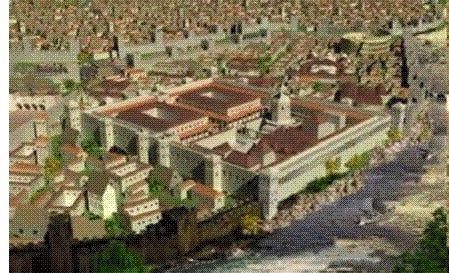 At its height, which was during the Roman era, it reached a population of 500,000 and was the third largest city in the empire after Rome and Alexandria. It became famous enough to acquire several nicknames; "Fair Crown of the Orient" and "Queen of the East". In addition, during the Roman Empire, it became known as the "cradle of Christianity". Although Christianity was founded in Jerusalem, persecution drove many of the early Christians to Antioch where they began the evangelization of the empire. After the division of the Roman Empire into East and West, Antioch went into decline, due primarily to disasters. In only a three year period, it was engulfed by fire (525 A.D.) and struck by two major earthquakes (526 and 528), killing as much as 70% of the city's population. During the Byzantine-Sassanid Wars of the 6th century, it was sacked by the Sassanid army and much of its population reduced to slavery (see Byzantine-Sassanid Wars). The city never recovered from these events and today Antakiya (ancient Antioch) is a sleepy town of about 35,000.